how many of you would use a MOSSBERG SHOCKWAVE -for home defense like me ? Never been much of a shotgun guy. I own more guns than I can count but I have only 2 shotguns, and the last time I shot my Remington shotgun was over 20 years ago. I use a handgun for self and home defense. If I was going to do so, I would file for an SBS stamp and toss a normal stock on it. Yea. I cannot shoot one anymore due to my neck, but before that - this was one reason I always avoided getting one for home defense. 9mm is loud enough inside. I have a 20 gauge Shockwave that is part of my home defense "package". 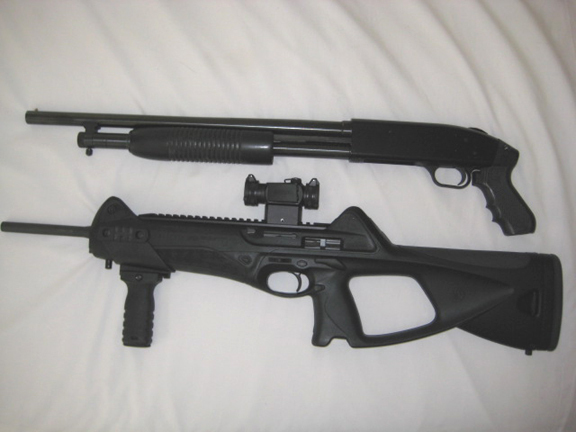 My 1st shotgun was a 12 gauge pistol grip - bought in the late 1990s. I took it to the range and fired it many times with the pistol grip. ONE time. After that 1st range trip, I went and bought a stock, and put it on the gun. Never shot a pistol grip 12 gauge again, and never will. And, I never shot buckshot thru it - I can only imagine how that would feel with a pistol grip. Kinda looks looks like any gun you shoot inside is going to cause about the same amount of hearing damage, so you might as well use whatever you feel the most confident with. For me it will be the first loaded weapon I can get my hands on. If I have any extra time I will be more selective or grab two. Kinda looks looks like any gun you shoot inside is going to cause about the same amount of hearing damage, so you might as well use whatever you feel the most confident with..
Boomer is about 172-175 dB unsuppressed, depending on ammo and round. Suppressed about 30 dB quieter but as painful as you’ve probably never experienced. There are some bolt .50 that significantly louder on the range, likely another 3 dB over Boomer. Walking up on the firing line in an open space becomes painful at about 30 yards with no hearing protection, and at 10 yards without double hearing protection. I have shot a 9mm without hearing protection inside once. It really was not that bad. I have also heard a shotgun being fired at an indoor range before - WITH hearing protection on. It IS louder than a 9mm handgun. Years ago, I bought a pistol gripped Mossberg 500 for home defense. Very soon that thing was traded off. That is one shotgun, had I been able to test one before buying, I would never have bought in the first place. Now some people have them and swear by them, but for myself, I'll stick with a regular stocked shotgun for home defensive purposes from now on. My current ones are the Winchester SXP Defender with the 18.5" barrel, and a Mossberg 500 with a 20" barrel. Well, think what ya want. On a shotgun, the type of round probably makes a difference too. And, the sound pulse and frequency could have a huge difference on what sounds louder. I also once had a comped 45ACP 1911 that was always the loudest gun on the range. Much louder than the other guns being shot. So, it can also depend on the gun. I'd use the Shockwave for home defense but first I'd put in an OPSol Mini-Clip. (made in Texas) It allows the reliable use of Aguila mini-shells which still have more punch than my .45. Might reduce the chance of blowing out my ear drums indoors. Honestly - if you go down that road - then why have the gun at all?